The following excerpt is from the Orthodoxy in America Lecture given by Professor Albert J. Raboteau at Fordham University, Bronx, New York, entitled, “In the World, Not of the World, For the Sake of the World: Orthodoxy and American Culture” on April 4, 2006. An Orthodox response to poverty and social injustice, the lecture goes on to elucidate the teaching and actions of the Church Fathers in obedience to the Gospel commandments. Below we spotlight an almost forgotten moment in American Orthodox history – when His Eminence Iakovos, Greek Archbishop of North and South America, stepped forward as an Orthodox Christian against injustice. 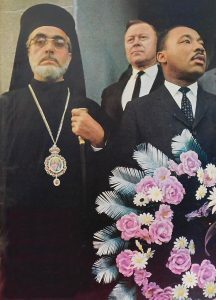 Permit me to use a visual epigraph to introduce this lecture: a Life magazine cover photograph of Archbishop Iakovos standing next to Martin Luther King, Jr., at a civil rights demonstration in Selma, Alabama. How this extraordinary juxtaposition came about requires some historical explanation. On February 17, Alabama state troopers, wielding billy clubs, attacked a group of marchers in nearby Marion. “Negroes could be heard screaming and loud whacks rang through the square,” reported a New York Times correspondent from the scene. When twenty-six year old Jimmie Lee Jackson rushed to protect his mother, Viola, and his eighty-two-year-old grandfather, Cager Lee, from being beaten, a trooper shot him twice in the stomach. He was taken to Good Samaritan Hospital in Selma where he died on February 26th. In response to Jackson’s death, SCLC leaders conceived a plan to march from Selma to the state capitol of Montgomery, a distance of fifty-four miles. On Sunday, March 7th, a group of marchers started across the Edmund Pettus Bridge toward Route 80, the highway to Montgomery. On the bridge they were met by a large contingent of Alabama State troopers and local police. After warning the marchers to disperse, the police charged the crowd with tear gas and billy clubs. Newspaper and television pictures of “Bloody Sunday,” as the event came to be known, stirred outrage across the nation. Martin Luther King, Jr., issued a nation-wide call for religious and civic leaders to come to Selma to participate in another march, scheduled for Tuesday, March 9th. Among the hundreds of clergy responding to King’s invitation was Reverend James Reeb, a thirty-eight year old white Unitarian minister, who worked as a community organizer for the Friends Service Committee in the inner city neighborhoods of Roxbury, Massachusetts. Reeb not only worked to improve housing in poor black neighborhoods, he insisted on living there as well, with his wife and their four small children.2The second march was brief. 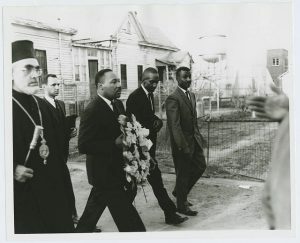 Due to a temporary restraining order prohibiting a Selma to Montgomery march, King decided to march only to the point of confrontation with the police. Facing the state troopers and police forces again on the Pettus Bridge, the marchers turned and retreated to a mass meeting at Brown Chapel A.M.E. Church. There King asked those who had come from afar to remain until a final decision on the legality of the march to Montgomery came down from the court. That night Reeb, and two other Unitarian ministers, were attacked by three white men outside a Klu Klux Klan hangout in Selma. Clubbed to the ground, Reeb suffered a massive concussion. His death two days later prompted a national uproar. President Lyndon Johnson went on national television to decry Reeb’s murder as an “American tragedy.” And in response to the public pressure, the Administration finally sent a voting rights bill to Congress. On Monday, March 15, a memorial service for James Reeb was held at Brown Chapel. White officials denied permission to hold memorial services at the courthouse, which would have symbolized the cause that cost Reeb and Jimmy Lee Jackson their lives. As the congregation waited for King to arrive for the service, distinguished leaders, who had gathered from around the country (including Archbishop Iakovos) eulogized Reeb and linked arms to sing “We Shall Overcome” and other movement hymns. The Archbishop spoke briefly about the meaning of Reeb’s death. As much as his words, the Archbishop’s presence at Selma was, as his critics perceived, a powerful symbol of an Orthodox commitment to social justice…. Professor Raboteau’s full lecture can be read on-line (or watched in video) here. 1. The following account of the Selma campaign is drawn from Taylor Branch, At Canaan’s Edge: America in the King Years 1965-68(New York: Simon & Schuster, 2006); Charles E. Fager, Selma 1965; The March That Changed the South, Fortieth Anniversary Edition(Fayetteville, NC: Kimo Press, 2005); Sheyann Webb and Rachel West Nelson, Selma, Lord, Selma: Childhood Memories of the Civil-Rights Days, as told to Frank Sikora (Tuscaloosa, AL: The University of Alabama Press, 1980). 2. Gustav Niebuhr, “A Civil Rights Martyr Remembered,” The New York Times,April 8, 2000. 3. The “Complete Works” of His Eminence Archbishop Iakovos,Volume Two, Part 1, 1959-1977, ed. by Demetrios J. Constantelos (Brookline, MA: Holy Cross Orthodox Press, 1999), pp. 198-199.